Sometimes you have to go with the flow. I had a different post planned for today but then my very market-savvy sister sent me the latest issue of Christie’s Interiors. Finishing up her thesis for her Decorative Arts Masters, she faithfully follows all the auctions and knew this was one I would love. Christie’s Interiors is a marvelous source for collectibles and more reasonably priced fine and decorative art in almost every category. I love how it’s presented in a magazine format with all the information at your fingertips in an easy to read and enlarge format. No challenging fine print here! 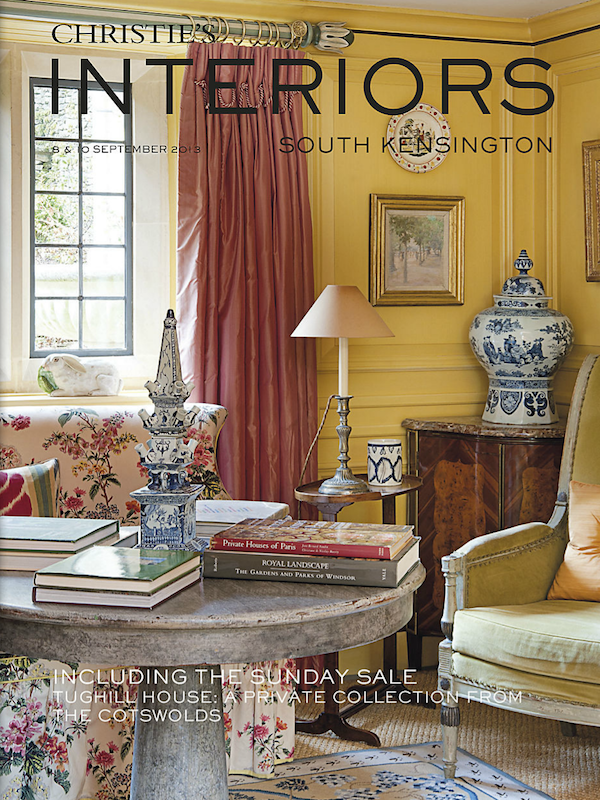 This issue includes the irresistible Sunday Sale of the contents of Tughill House. 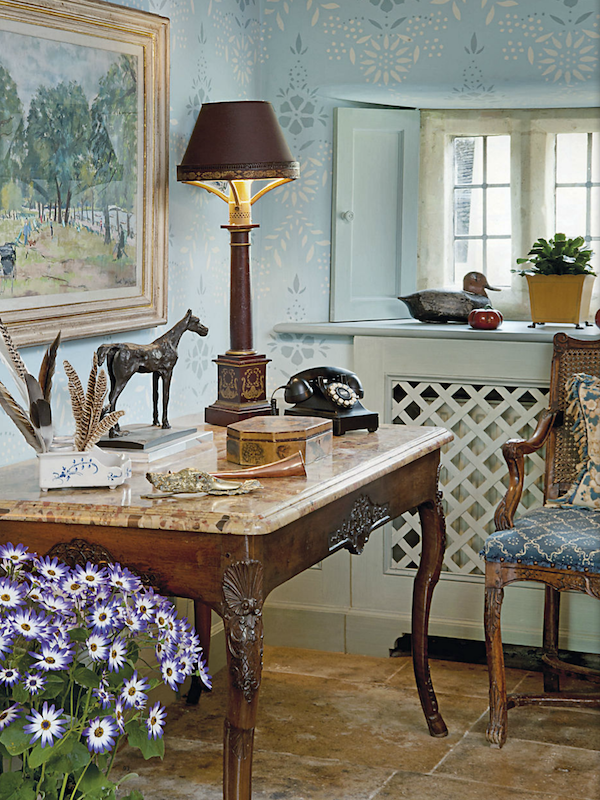 Purchased in 1975 by Stanley Falconer, a director of design firm Sibyl Colefax & John Fowler, the Cotswolds cottage was added to over the years and developed into a refined expression of his vision. 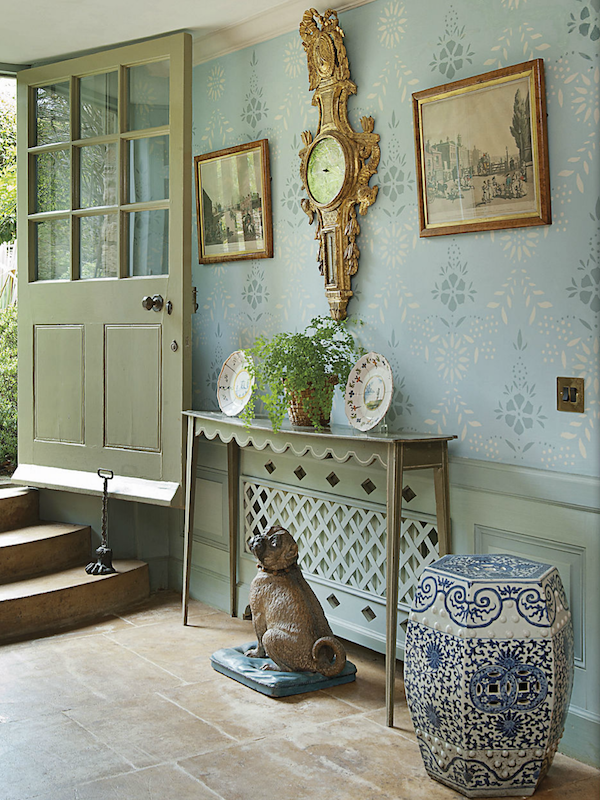 The epitome of the English country style at which Colefax & Fowler excels, the auction includes an incredible selection of furniture, decorative objects, ceramics and art all personally selected by Falconer for the house. 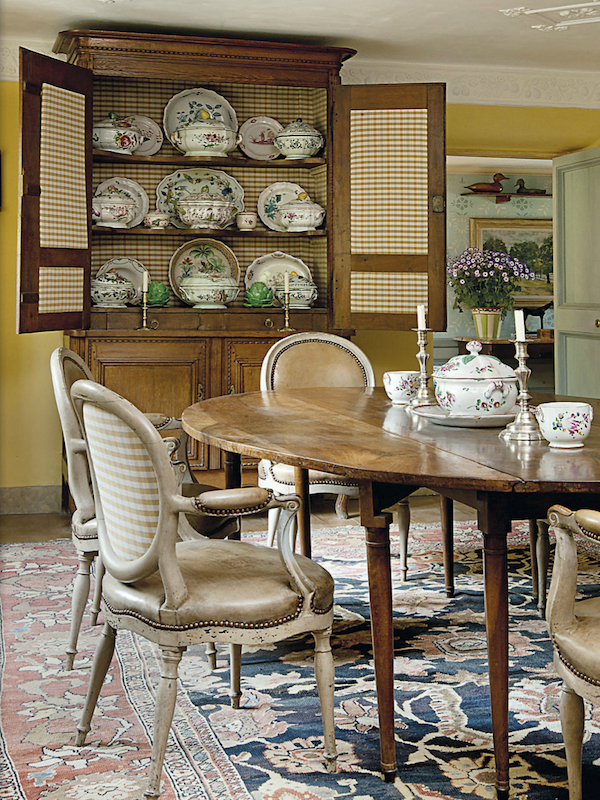 Let’s have a cup of virtual tea as we take a little tour of this exceptionally charming collection. How beautiful is the palette in this room. I adore the mix of soft mossy greens and range of blues. From this small entry alone there are innumerable items to ogle over. We often see reproduction garden seats (I have one in fact) but these (there are a pair) are the real deal – 19th century Chinese export with lotus pattern. The late 18th century Louis XVI barometer would look just as smashing in a pared down modern room as a single touch of period extravagance. And for all you pug lovers, you can dream of this adorable late 19th century Austrian terracotta painted version, seated on a realistically modeled blue cushion. While not pictured in the room, this extraordinary late 18th c. Dutch Delft garniture set with unusual parrot finials was too good not to share. And how charming is this painted side table with scalloped apron. At only 8-1/2″ deep, it is the perfect decorative piece for tight spaces. I don’t think there is anything in this room I DON’T want. 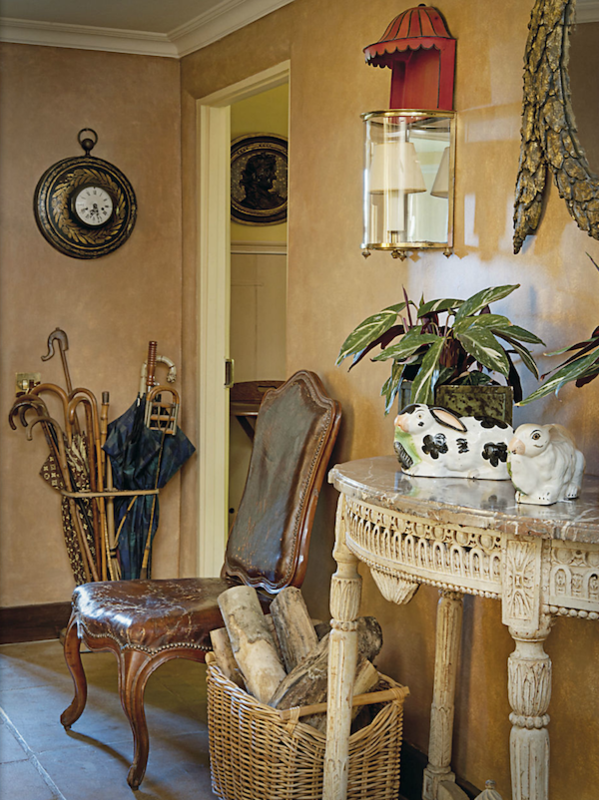 From the perfectly worn Louis XV leather upholstered oak side chair to the intricately carved Louis XVI painted console table to the tole and brass lanterns, it is a vignette oozing with charm. A favorite from the space is the Victorian tole stick stand, of course equally suitable for brollies. The French ebonised walnut portrait bust is the sort of interesting piece that adds instant character to any space, as well as that glamorous touch of gilt and black – Alexa Hampton, this is calling your name! And for that quintessential English country look, authentic 19th century staffordshire bunnies are the perfect touch. I think a telephone table is such a civilized concept. Since my cordless phones are always disappearing or losing power, the charm of this scene holds even more allure. As I peeked more closely, it looks like this might be the push button version of a rotary phone – a modern way to update a vintage look. The handsome 18th c. regence walnut table can of course be yours as well as a very similar pair of handsome Charles II tole-peinte and ormulu lamps. How fabulous is this set of six 19th c. French painted beech chairs? Upholstered with pale olive leather, the classic Colefax conceit of a check on the medallion backs adds to the country charm. The handsome table is a Directoire figured walnut oval drop-leaf. You can see the beautiful patina of the wood, a marvelous match to the weathered leather. The classic antique Sultanabad is a great hard-to-find size – 10’1″ x 12’8″. I was just telling a friend today how I was looking for something similar. With timeless decorative appeal, orientals look great with a variety of styles and are actually great rugs for houses with kids and dogs. – very forgiving. Weren’t we just talking about how peacock is the shade du jour? 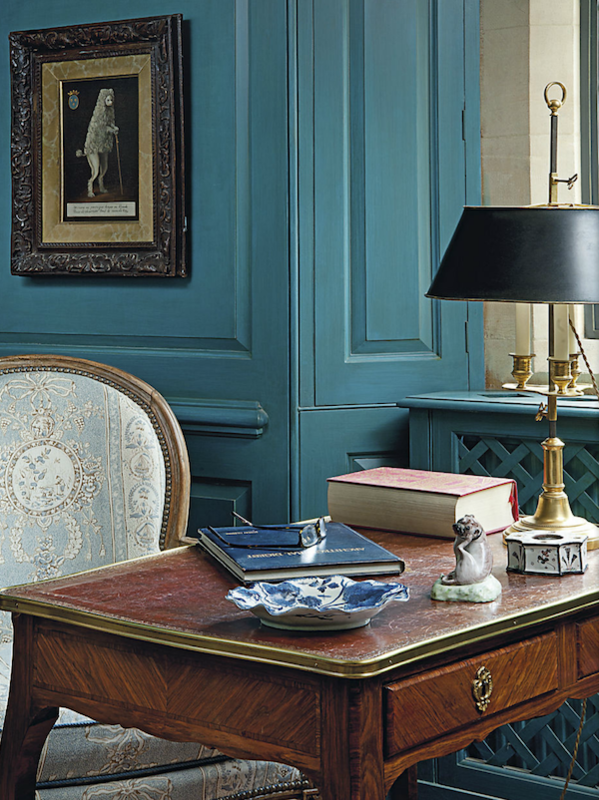 Well it looks mighty handsome here paired with this Louis VX ormolu-mounted kingwood bureau plat! The beautiful 18th c. walnut bergere is one of a pair, upholstered in a very pretty print. The brass lamp is offered as one of a set of seven, ranging from late 19th to early 20th centuries. 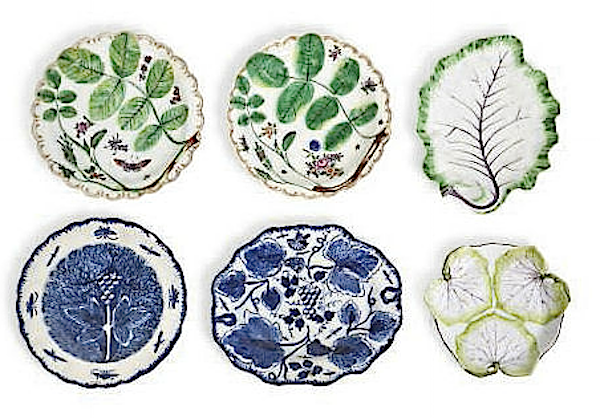 And the dish is part of a grouping of lovely leaf-shaped dishes and plates, so handy as bed side receptacles, serving dishes or pretty catch alls. 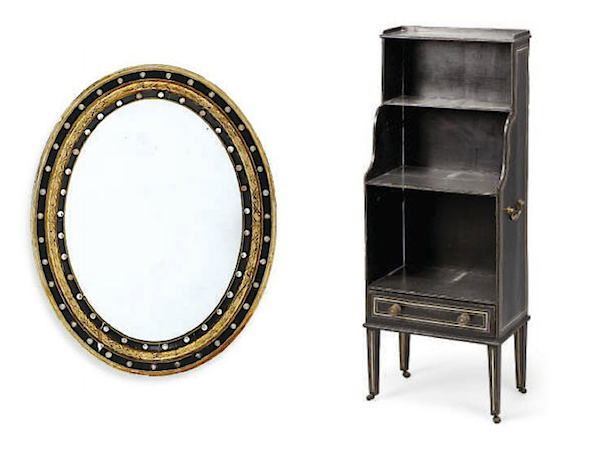 On my list from this room (not shown in the shot) would also be this elegant Irish oval glass and ebonised mirror as well as this small early 19th c. regency ebonised and gilt decorated waterfall bookcase. This classic go-anywhere piece is a great addition to bedroom, hall or office. This is truly the tip of the iceberg in a veritable treasure trove of offerings. 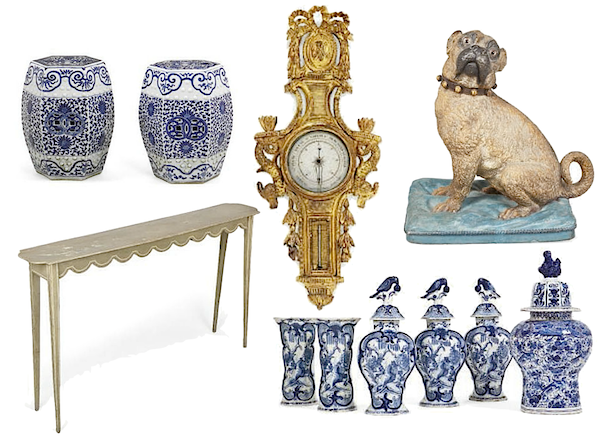 There are so very many wonderful pieces in this auction that it just might be worth investigating a container to ship home. Christie’s can of course help you with all your transport needs. 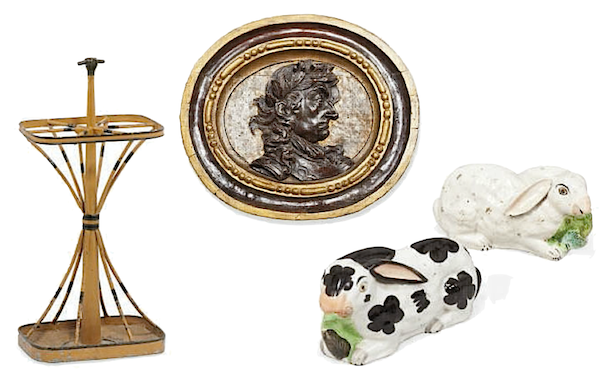 But do hurry if you’re tempted – the auction starts this Sunday! This entry posted in art, auctions, Christie's, furniture, interior design. Entry Tags: auctions, Christie's Bookmark the permalink. Just shows why great design is timeless…makes me want to take a quick vacation across the pond simply to relax! How perfectly wonderful. Thank you, thank you, thank you. 78 queries in 0.402 seconds.